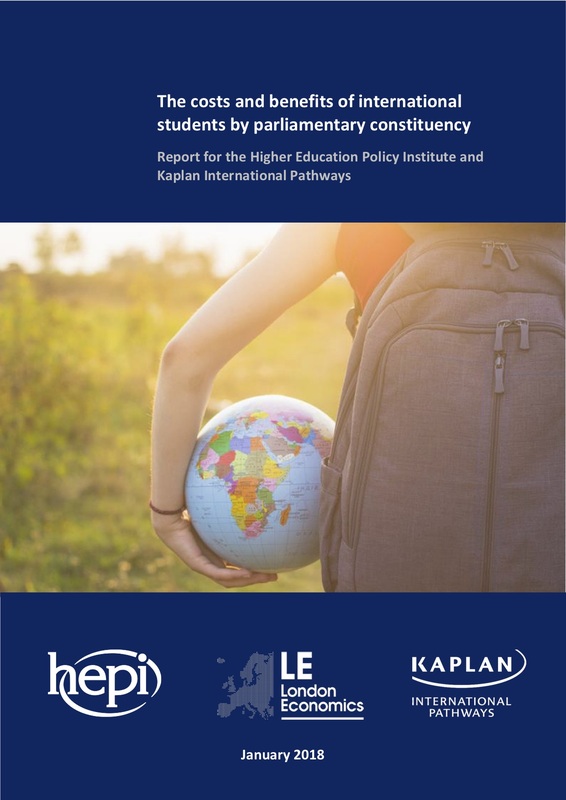 The Higher Education Policy Institute and Kaplan International Pathways are jointly publishing a major new piece of research, The costs and benefits of international students by parliamentary constituency, undertaken by London Economics. students in Northern Ireland generate £0.17 billion. students in Belfast South generate £29 million. International students bring economic benefits to the UK that are worth ten times the costs of hosting them. Trying to persuade the Home Office that international students nearly always benefit the UK can feel like banging one’s head against a brick wall. In the past, they have not accepted figures on the benefits on the grounds that they ignore the costs. Our work, in contrast, includes all the potential costs and conclusively proves these are small compared to the huge benefits. We welcomed the Government’s decision to ask the Migration Advisory Committee (MAC) to investigate international students. We now implore Ministers and civil servants as well as the MAC to take this new evidence with the seriousness that it merits. Given the detail that we are presenting, we also urge the MAC to report earlier than the planned date of September 2018. In recent decades, the UK has been phenomenally successful in recruiting international students, second only to the US. Other countries – notably Australia – have been catching up and the UK is now showing signs of losing ground. This research is different to previous work in a number of important respects. In particular, by calculating the net impact by region and constituency, the study shows that international students bring economic benefits to regions throughout the UK. The challenge now is to ensure the UK provides a compelling and attractive offer as the best place to study. To be successful, we need a bold commitment from Government as it considers the Immigration Bill to show the UK welcomes international students more than ever. A key step would be to stop counting students as immigrants in net migration statistics. This research fills important gaps in our knowledge: while we knew that the benefits of hosting so many international students are large, we did not previously know how limited the costs are. Nor did we know how the benefits break down geographically across the UK. ‘It is vital that policymakers do not ignore these findings. Migration policy needs to be more rooted in evidence than has been the case over the past few years. ‘While our research focuses on economic impact, it would be wrong to imply that the benefits international students bring are only financial. In addition to their enormous economic impact, they also make our university campuses more diverse, resulting in educational and social benefits. HEPI’s insightful and timely analysis underlines the critical contribution made by international students to the UK’s economic, intellectual and cultural capital. At a time when our nation’s global outlook is changing, international students and alumni also act as powerful ambassadors and friends around the world. The University of Nottingham is proud to host some 9,000 international students world-wide from 150 nations; enhancing cultural diversity and enriching learning for all of our students who develop internationally-relevant skills and lifelong friendships around the world. This report is extremely valuable. In taking account of the costs of international students, a comprehensive picture emerges: for every £1 non-EU students cost they generate £15 of benefits. In breaking down the benefits of international students by parliamentary constituency – the first report to do so – new insights are revealed. The main beneficiaries of international students are spread right across the country – from Newcastle, through Liverpool, Leeds, Sheffield, Coventry, and Cardiff to Portsmouth. Encouraging international students to come to the UK should be central to the UK’s industrial strategy and a key part of supporting a global Britain post-Brexit. The analysis concentrates on the cohort of international – EU and non-EU – first-year students attending UK universities in 2015/16 (which is the most recent cohort for which detailed data exist). The figures are presented in 2015/16 prices, and discounted to reflect net present values. The study measures the impact of one cohort of students over the course of their studies, which is similar to the impact of all (i.e. first-year and continuing) international students attending higher education in one particular year. The Higher Education Policy Institute (HEPI) was established in 2002 to influence the higher education debate with evidence. We are UK-wide, independent and non-partisan. We are funded by organisations and universities that wish to see a vibrant higher education debate, as well as through our own events. HEPI is a company limited by guarantee and a registered charity. Kaplan International Pathways supports the higher education sector worldwide in achieving its internationalisation and diversity ambitions. It does this through on- and off-campus pathway programmes for international students and innovative solutions such as Transnational Education, online delivery, targeted direct student recruitment, and student residences. London Economics is one of Europe’s leading specialist economics and policy consultancies. Our approach combines the use of economic theory and sophisticated quantitative methods, including the latest insights from behavioural economics, with practical know-how ranging from commonly-used market research tools to advanced experimental methods at the frontier of applied social science. The research builds on earlier work conducted jointly by HEPI and Kaplan on the attitudes of higher education applicants towards learning alongside people from other nations (2015) and a detailed study undertaken by London Economics for HEPI and Kaplan on the likely impact of Brexit on demand for UK higher education (2017). Historically, this island has developed by international reciprocity. On a personal note, in the past I have been responsible for the introduction of Exchanges of students with families in France and as a result we stil have past students who remain in touch many years later . Members of my own family have hosted international students from Japan ,South Korea and Mexico. As a result not only are we enriched but each of those individuals have been able to return to their countries with positive experiences of the support they have had from this country. We have made lifelong friends. To add to Linda Cowan’s contribution, it is an absolute uncontestable truth that international students should never be counted as immigrants in net migration statistics.Their overall value goes way beyond the already convincing positive financial figures. We must not shoot ourselves in the foot. that was good to have this information but can you please send applications links too?